Any woman who is a fixed planner living in a chaotic world of motherhood and other responsibilities may surely appreciate Baby Change. This app was developed by Ninebark LLC and costs $2.99. Baby Change is sort of an electronic nanny with which you can track your baby’s every (almost) move using your iPhone, iPod Touch or iPad. Baby Change is described by the developer as an elegant, easy-to-use app, but I did not find it to be that exactly. It essentially consists of a series of alarms and timers with icons next to them. The icons include diaper changing, feeding, napping, and an extra for whatever else may come up. Once you have set your alarms, which correspond to the timers, there are many options for resetting them. There is a button to reset all alarms or reset all timers or you can double tap the icons, which will automatically reset the adjacent timer. 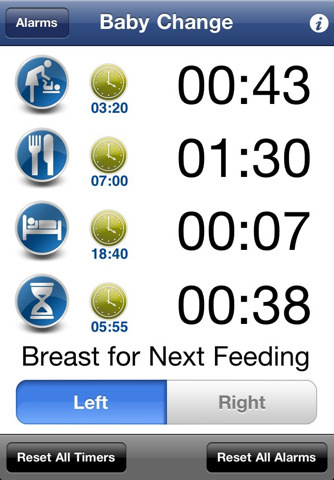 Once your timer runs out you get a push notification alerting you that it is time to change a smelly diaper. I have not quite wrapped my head around the diaper changing reminder. Does the baby pee and poop like clockwork? Is it every 2 hours that that diaper will be soaking with something? There are two main sections you can toggle between, one for the left breast and one for right. I have never breastfed so I have no idea, but having an option for you to keep track of which breast you last fed from seems a little odd to me; I don’t see how you could forget. My mom fed, changed, and napped four babies without the help of an app. I suppose if you are singularly trying to manage other children or work from home while simultaneously taking care of your newborn, then this app may come in handy. Baby Change may provide a slightly less time consuming alternative for keeping a hand-written log about the everyday goings on in your baby’s life. 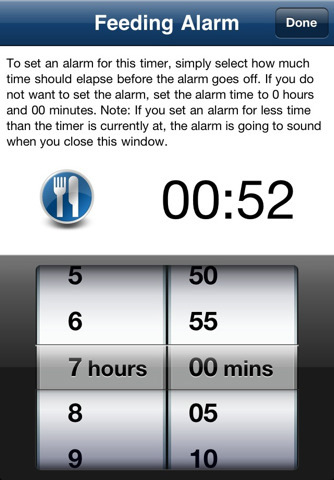 Whether you want to spend 3 dollars on an app or just use your phone, iPod, or iPad’s alarms is up to you. I am not convinced that this app is absolutely necessary. AppSafari review of Baby Change was written by Vanessa Paszterko on September 20th, 2010 and categorized under App Store, Calendar, Health, iPad apps, Productivity, Utilities. Page viewed 4043 times, 1 so far today. Need help on using these apps? Please read the Help Page.